How the pre-selling sales strategy used by book publishers - and LinkedIn’s Sales Navigator - will set you up to make a great first impression with your prospects. What is the last book you couldn’t wait to get your hands on? Was it How to Be a Power Connector: The 5+50+100 Rule for Turning Your Business Network into Profits? Or perhaps Agile Selling: Get Up to Speed Quickly in Today’s Ever-Changing Sales World? Buying a new book can feel like a hit-or-miss operation, especially the one you are considering is written by a new author. That’s why publishers use a sales strategy called pre-selling to prime an audience, get them interested, and establish a connection before a book is released. Then, when that book is finally published, the audience is ready and waiting. Social sellers face a similar challenge to book publishers. Long before your prospect will consider listening to you about your product or service, you have to convince them that connecting with you is worth their time. That’s why as a social seller, you need to focus on building a connection with your prospects well before you expect to make a sale. 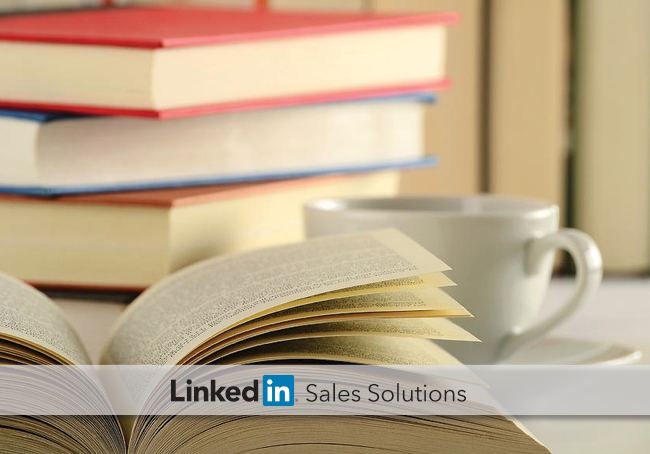 Here’s how book publishers sell a book before their prospects can get their hands on it – and how you can use LinkedIn Sales Navigator to follow their lead and pre-sell yourself to prospects before you make the first connection. Publishing is all about reaching the people most likely to be interested in the new book. In addition, publishers know that when they want to find new readers, they need to reach out to audiences similar to the ones who enjoyed that genre in the past. For example, publishers of romance novels focus on women between the ages of 30 and 54 with an average income of $55,000. Use Expanded Search to find prospects with the seniority, role and company size you want to connect with and save them for future reference. Look for Lead Recommendations in your email based on the leads you saved, and your search preferences. Finally, visit the profiles of your existing customers. Look for new prospects of a similar level at companies within their network. Research shows that online book reviews can have a significant impact on book sales. Gathering social proof is an important aspect of pre-selling. Uncover prospects with personal connections to your current clients with Expanded Search. Use TeamLink to find colleagues throughout your organization who already know your potential prospects. Ask your clients or colleagues to help you make a warm connection through an Introduction on LinkedIn. Readers want to know what’s in it for them when they consider purchasing a new book. Will they enjoy reading the book? Will they get useful information out of it? Publishers help readers understand how a book will satisfy their goals by letting potential customers read the first chapter or two online. You can take this approach by sharing your knowledge with your prospects before you try to connect with them. Use Expanded Search to build a lead list of prospects and companies with whom you want to develop relationships. Get Daily Alerts about what your saved prospects are discussing and sharing on LinkedIn. Join in the conversation when they post in groups or create customer-centric content that answers their questions. Publishers know that readers always judge a book by its cover. That’s why they create bright, engaging covers that attract the eye and make use of every inch of visual real estate. The background image gives readers a clue to the tone of the book, and every bit of text on the cover is styled to entice readers to purchase. When your prospects look you up on LinkedIn, they’re judging you by your cover as well. Create a profile that will get the attention of your prospects. Upload a high-quality, profile image. A LinkedIn Sales Navigator subscription gives you a 30% larger profile photo. Choose a relevant background image. Focus on images that are related to your field, yet add some personality so your prospects can develop a sense of who you are. Book publishers understand how to move their prospects forward in the buying cycle. By using pre-selling, they help potential customers understand what they can achieve by reading the book – and even create anticipation prior to the launch. With LinkedIn Sales Navigator, you can develop relationships with your prospects before you reach out to them for the first time. By using the same pre-selling techniques, you can create interest with your prospects making your first connection successful.